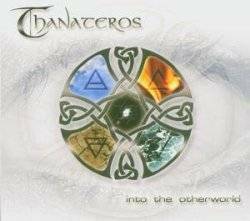 Into The Otherworld is the third album by German Celtic rock band Thanateros. The album artwork is looking quite cheap and the music isn't faring much better. If Thanateros think that it is original to combine melodic rock and hard rock with traditional Celtic tunes, it's time for them to learn that Skyclad have done this already for more than ten years in a much better way. Skyclad never got much recognition, and we can only hope that Thanateros will share the same fate, as exciting moments are very rare on this album. A positive point certainly is that there are lots of opposites on the record which is never sounding the same. There are folk metal songs like No Rest (my favourite song) and Follow where Thanateros sound a bit like Skyclad. Thanateros don't try to hide their German roots, with Siuil a run and I'm Changing sounding a lot like Subway To Sally, probably one of their major influences. Traditional instruments like flutes and violins show a positive intention, but the general impression is that the necessary kick is often missing. Lots of tracks are just boring because they are too slow (Song As A Kiss, Last Goodbye) or too wave and gothic (In Time, Four Winds). There is a cover version of the Pogues' Dirty Old Town, but as I didn't like the original, this one doesn't work for me either. Vocalist Ben Richter, trying to sound as emotional as Nick Cave, fails eventually and doesn't add quality. With their style of rock combined with history conscious medieval culture, it can be vouchsafed that Thanateros will find their fans exclusively in Germany.